When he jumped in the water at the 2015 World Championships in Kazan, Russia, Jordan Wilimovsky’s goal was to finish in the top 10. The Olympics were just over a year away, and Wilimovsky knew that if he snagged a top-10 result, he would secure his spot on the United States’ team in Rio de Janeiro. Nearly two hours later, the rising Northwestern senior was a world champion. He blew away the competition to win the 10 kilometer open water swim by around 12 seconds, the largest margin in the history of the event. Three months after his 21st birthday, the unassuming Wilimovsky had not only secured his Olympic berth, he established himself as the best open water swimmer in the world. Wilimovsky took this academic year off from NU to live at home in Southern California and train with Dave Kelsheimer, who has coached Wilimovsky since 2010. Under Kelsheimer’s tutelage, Wilimovsky is also attempting to make the Olympic team in the 1,500 meter freestyle, the longest event in the pool. To qualify in that event, Wilimovsky will need to finish in the top two at the U.S. Olympic Team Swimming Trials in early July. Wilimovsky wasn’t a swimming prodigy from a young age. He decided to start taking lessons at age 9, after he couldn’t join his friends at a summer camp because he failed a swim test. As he grew older, however, Wilimovsky honed in on swimming. 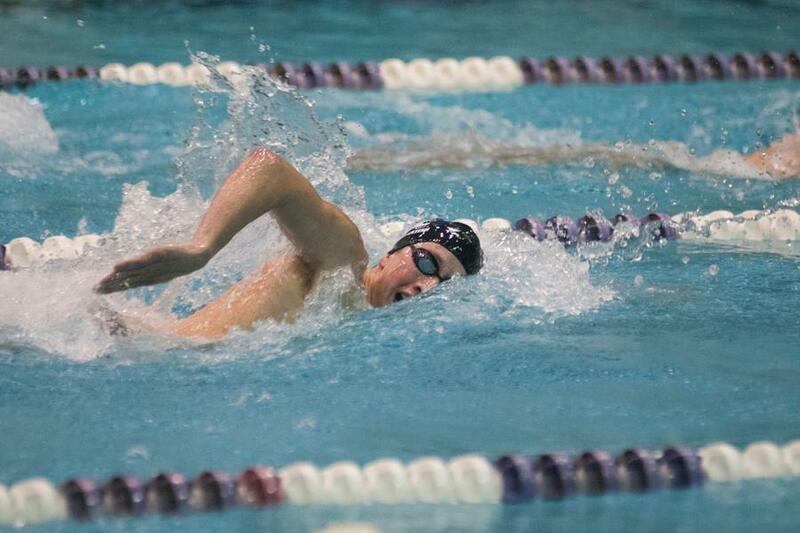 When he joined Kelsheimer in 2010 he had developed the work ethic to be an elite-level swimmer, his coach said. The increased training helped Wilimovsky. Though he also had the requisite natural swimming ability, Kelsheimer said, he did not become a superstar overnight. By the summer of 2012, however, Wilimovsky was making waves in the swimming community. He won open water silver medals at U.S. Nationals and the World Junior Championships, and he was the American junior champion in the 1,500 meters. He also swam at the 2012 U.S. Olympic trials. A year before he made the open water world championship team in 2013, Wilimovsky and his coach spoke of what the future looked like. “Looking forward in 2012, we had a conversation that in four years time (Wilimovsky) could be heading to the Olympics in the 10K and in the pool,” Kelsheimer said of the discussion. Wilimovsky found success right away once arriving at NU. Just a month into his college career, his 1,650 yard freestyle time ranked second in program history. By the end of that season, he held the school record in the 1,650. But Wilimovsky wasn’t expected to make such a huge impact so quickly. By his sophomore season, he was an All-American, finished fourth in the 1,650 at the NCAA Championships and had NU records in three events. He further improved his junior season, winning the Big Ten title in the 1,650 and finishing third at NCAAs. Despite his lengthy successes in the pool, Wilimovsky often seems like a normal guy on dry land, said his teammate, junior Stephen Shull. Unlike superstar swimmers such as Michael Phelps and Missy Franklin, Wilimovsky is not often recognized even within the swimming community. At just 5-foot-10-inches and 150 pounds, Wilimovsky doesn’t look like an imposing, world-class athlete. As Wilimovsky climbed the college ranks, he also racked up impressive international results. He won three medals at national championships during the 2014 summer, and qualified for the Pan Pacific Championships in Australia in both the 1,500 meter freestyle and the 10 kilometer open water event. He finished No. 16 in the open water at that meet behind three other Americans. But focusing on that result, Kelsheimer said, overlooks Wilimovsky’s emergence as an elite 1,500 meter swimmer. He set three personal bests that summer, Kelsheimer said, and became the seventh fastest American ever in the 1,500. Most importantly, Wilimovsky dropped nearly 30 seconds in a year and cracked 15 minutes in the event. In 2015, Wilimovsky established himself among the best swimmers in the world. Just a month after the NCAA Championships, he effortlessly pulled away from a small pack to win the 10 kilometer national title, his first senior-level national championship. In the summer a few months later, he swam a perfectly executed race in Russia. He swiftly glided from the back of the pack to the lead, Kelsheimer said, and pulled away to win the U.S.’s first championship in the event since 2005. After the biggest win of his career, Wilimovsky didn’t rest. Instead, he returned to the U.S. to swim at the national championships, less than two weeks after his win in the 10 kilometer race. He won the event by more than 13 seconds, and though many of the top swimmers at the event did not compete, it was all part of his plan to prepare to swim both events in Rio. “It’s what we’ve been practicing since 2012 in different versions,” Kelsheimer said of swimming the races back-to-back. With no lane lines, chlorinated water or walls to push off of, open water swimming has far more variables than pool events. Most courses include a loop or circuit that swimmers complete several times, successfully maneuvering around a handful of buoys to stay on course. Races also have feed stations, which require swimmers to grab and consume a food or drink package while still swimming. Weather conditions and water temperatures can also vary, as can water quality. One significant challenge he can’t control is being barreled into by other swimmers. As crowds gather during a race, being undersized like Wilimovsky can be a distinct disadvantage. “His size is definitely a factor where there are no lane lines and people regularly are aggressive, jostle your space and try to manhandle you as opposed to just beating you based on how fast you are,” Kelsheimer said. Training is an additional challenge of open water swimming. Since it is impractical to swim in open water every day, Wilimovsky does most of his training in the pool. He must then transition back to the open water on race days. That has led him to some creative training patterns. At NU, Schroeder often removed the lane lines from the pool and directed Wilimovsky to swim in circles around the pool’s edges. He would skip weight room sessions to spend more hours in the pool, swimming far more yardage than his teammates. Wilimovsky, however, doesn’t mind that at all. “Personally, I like to do all my training in the pool … because it’s easy to measure and quantify times and yards,” he said. The United States is the most successful Olympic swimming nation of all-time, far outclassing every other country. Its open water performances, however, pale in comparison to pool results. The U.S. men do not have an Olympic medal in the 10 kilometer event, which joined the Olympic program in 2008. Before Wilimovsky’s win last summer, American men had won open water world championships only in 1991 and 2005. Wilimovsky is the defending world champion, and the Olympics are less than three months away. Nonetheless, he said he feels no pressure, saying the unpredictability of open water swimming means “there isn’t really a favorite.” He won’t deny, however, the possibility of returning to Evanston in the fall with an Olympic medal.